Variables are an important part of an eye tracking experiment. A variable is anything that can change or be changed. In other words, it is any factor that can be manipulated, controlled for, or measured in an experiment. Experiments contain different types of variables, below we will present you with some of the main types and its definitions. We will round up by giving an example containing all variable types. 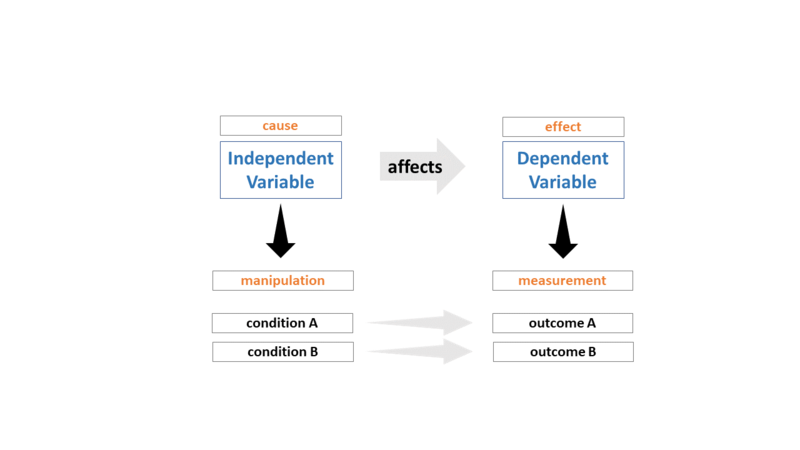 Independent variable (IV): Is the factor or condition that you manipulate in an experiment. Your hypothesis is that this variable causes a direct effect on the dependent variable. Dependent variable (DV): Is the factor that you observe or measure. As you vary your independent variable you watch what happens to your dependent variable. Figure 1. Shows the relationship between the independent and dependent variable. Figure 2. Displays the effect of extraneous variables on the relationship between the independent and dependent variables. Controlled variable (or constant variable): Are extraneous variables that you manage to keep constant or controlled for during the course of the experiment, as it may have an effect on your dependent variable as well. Participant variables: Participant variables can be defined as the differing individual characteristics that may impact how a participant responds in an experiment. Examples of participant variables include gender, age, ethnicity, socioeconomic status, literacy status, mood, clinical diagnosis, etc. Stimulus variables: The specific features of your stimulus or group of stimuli that are part of the context in which the behavior occurs. These are often an expression of or a subset of your independent variable and covariates. Examples include the number of items, item category, stimulus crowdedness, color, brightness, contrast, etc. Before you start your experiment, each variable needs to have a clear definition and a strategy on how to be measured and recorded. This process is called variable operationalization. For example, you are interested in studying the attitudes towards food, visual attention, and food choice. 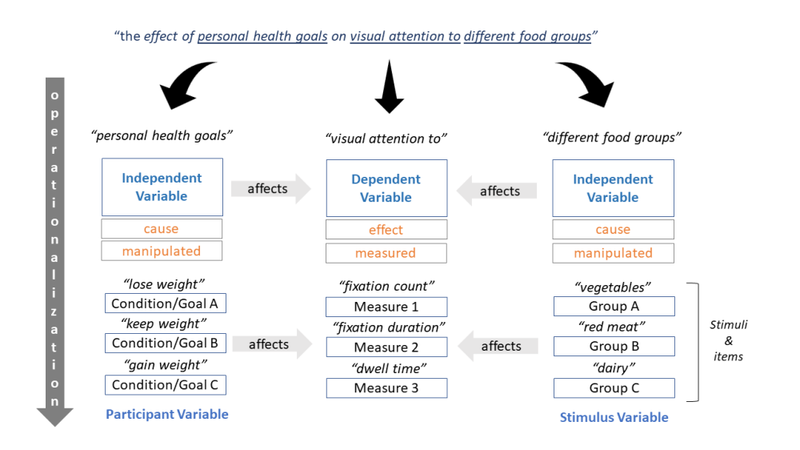 In your first study, your objective is to investigate “the effect of personal health goals on visual attention to different food groups”. The first part of your objective - “the effect of personal health goals…”- contains an independent variable. To operationalize it you need to ask yourself the following questions: what is a “personal health goal”? Can you quantify it and measure it? Can you break it down into discrete categories? How will you collect and record its value? Due to the nature of this term, your variable will most likely be composed of two or more categories (e.g. lose weight, keep weight, gain weight… etc.) and its value recorded by means of a questionnaire or interview. Notice that in this example, the independent variable is also an intrinsic attribute of a participant and thus particular to that individual, as a result, this variable can also be classified as a participant variable. The next part of your study objective - “…on visual attention to different food groups”- contains your dependent variable. Once again, you will need to ask yourself the following questions: What is visual attention? How do I measure it? How is food grouped? How will we represent the different groups in the stimuli? Which grouping strategy is relevant to my objective? The term “Visual attention to” can be operationalized into or more relevant visual behavior measures that can be quantified and measured continuously. For example, eye tracking metrics like fixation duration, fixation count, dwell time can provide you with information about the visual engagement and bias towards different items in your stimulus. The “… different food groups” term will most likely be operationalized as food types aggregated into categories (e.g. vegetables, red meat, dairy) and displayed on an image stimulus. Since you are manipulating the content of the stimulus and the manipulation affects the context in which the behavior occurs as well as the viewing behavior itself, your stimulus categories will be part of your set of independent variables and simultaneously a stimulus variable. Figure 3. 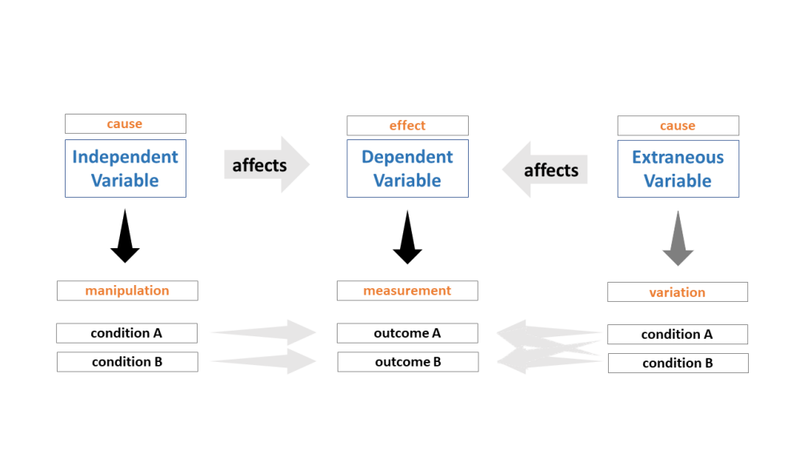 Shows one possible outcome of the operationalization of the different variables in the example study. The objective of this study is to find out whether “the effect of personal health goal on visual attention to different food groups”. In the example above, the participant’s “current hunger state” is a factor that may impact visual behavior and attention bias. If a test participant ate his/her meal a long time ago and feels hungry, his attention may become focused on high caloric food groups, even though he might normally not look to those food items when he/she is satiated. If you decide to ignore it, it becomes an extraneous variable in your experiment and may impact the relationship between your independent and dependent variable. On the other hand, if you decide to address it and control for it, you will also have to operationalize it, e.g. you can measure it as the elapsed time since the last meal. If you then ask all your study participants to eat a meal within 1 hour before your test, this variable becomes a controlled variable, as you try to standardize the level of hunger across your independent variable groups.